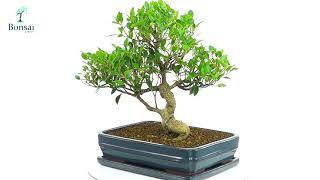 Beautiful character Ficus bonsai tree with wonderful detailing and fabulous glossy leaves. Very easy care so great for beginners. The taper and flow of this bonsai are exceptional. If you are looking for a bonsai which has outstanding proportions and character this is a great example. The uniquely and highly recommended ficus has eye-catching foliage, with dainty green leaflets emerging from a thick, upright trunk. Partly why the ficus is so popular is as a result of its undemanding care routine and suitability as a gift for both beginners and professionals alike, while being a lovely addition to a bonsai tree from any of our other ranges. The ficus itself is renowned for its aerial root system and glossy green leaves. It’s symbolic of fertility and love and has deep spiritual meaning from texts, including the Bible. To accompany your bonsai, we offer a very pretty range of optional gift wrap and personalisation templates as well as an azure blue pot and accompanying ceramic drip tray. The Ficus really is one of the best indoor bonsai trees for sale. It is the easiest to care for and displays such wonderful character. A very rewarding and beautiful indoor bonsai. This is an incredible bonsai is wonderful artistic appeal. A very attractive bonsai, ideal for beginners, with lovely flowing trunk. Gorgeous styling and extremely artistic. *This bonsai is 50 cm in height. * The trunk diameter is 5 cm. * The pot size is 36 x 28 cm.